Quantum (QB) series of frameless brushless servo motors are specifically designed for direct axis integration in machine applications where a housed motor is undesirable. The QB series are brushless kit motors (rotor & stator sets) designed to deliver high performance and servo precision at minimal cost. They can be easily customized to the exact specs required, and high speed QS versions are available with improved efficiency at high speeds. 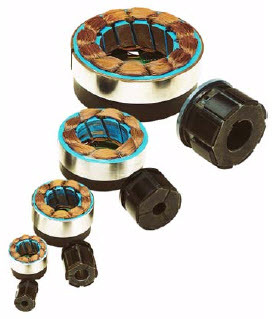 The QB series are optimized for high output power, high torque density, and low cogging torque. Their high power density ratio allows a smaller size motor to be used in many applications, saving space and weight. Quantum motors are also available as housed versions in standard NEMA sizes for use as traditional servo motors in typical servo applications. Common applications of the frameless QB series include high speed pumps and fans, laboratory automation, cash counter/handling devices, and semiconductor manufacturing.